Piggly Wiggly: The first self-service grocery store in the world. Getting your customers, clients and other stakeholders to serve themselves can bring a lot of efficiencies to your business. The idea of self service has been around a long time. 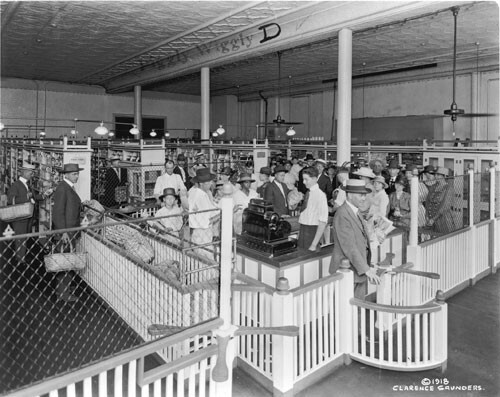 Back in 1917, the US Patent Office awarded Clarence Saunders a patent for a “self-serving store.” Saunders invited his customers to collect the goods they wanted to buy from the store and present them to a cashier, rather than have the store employee go around the store collecting the goods from a list provided by the customer. When combined with an internet that is quick, reliable and cheap to access, the self-service idea, has been quickly adopted for the internet and today buying from Amazon or managing your public library account is hardly given a second thought. Now these ideas are spreading from the retailing (B2C or Business to Consumer) sector, into the trade between businesses and organisations (B2B or Business to Business). High volume inventory replenishment can be handled by electronic messages between computers without much human intervention (using either EDI systems or Web Services). These systems can only serve a relatively narrow purpose and are expensive to implement. For lower volume and infrequent transactions, where the transaction is complex or requires human judgment, purpose-built websites can cost-effectively facilitate self-service. Today, we call these purpose built websites: customer and supplier portals. Allowing customers and stakeholders to serve themselves through your website has a whole lot of advantages for you and them. 1. Customers can access information any time they want. They can look up their records and check on their account balances, find out if you carry an item and whether any are in stock. If they want it, they can load their order themselves, no waiting for a staff member to become available. Customers don’t have to travel or queue to be served. Technical manuals can be downloaded without waiting for opening hours. Online booking systems are starting to appear in the health industry. Everything is quicker. 2. Customers can check how their order is progressing in near real time. Engineering parts distributors can show you how your order is passing through the supply chain. Maintenance contractors can upload images of replaced parts, condition reports and evidence of work done and the portal makes this information immediately available for customers to view. Engineers can give you real time progress reports as a building, road or bridge is being built. Online Gantt charts can show you where stress points are appearing in a project. Gone are the days when customers have to wait days or weeks for a report to be written and sent in the mail. 3. Customers can reach you from anywhere. If your portal is designed to be mobile responsive, then it can support any screen size, allowing customers to serve themselves from any device such as a mobile phone, a tablet, a laptop or a desktop computer, as long as they are connected to the internet. Supporting any device means customers can reach you from anywhere not just from their desks. 4. Less sales pressure. Potential customers can find out about your products and services at their own pace. They don’t need to receive volumes of printed materials and all the product and service knowledge is searchable. Potential customers don’t feel any sales pressure when all they want to do is understand how the products and services work and to learn more about you as a supplier. Once they’re confident about the products and services then they can short list you along with some other suppliers to contact. When they do turn up, they are almost ready to buy. 5. Less phone tag because your well designed portal makes everything easy to find and follow. There is less need to talk to someone. 1. Reduce communications costs. Communications can be carried out electronically without delay, saving on printing and postage. 2. Lower personnel costs. You won’t need as many staff and so you save on wages. You don’t need staff to be on hand 24/7 and so you save on penalty rates. Less staff can also mean smaller premises or delayed investment in additional office space..
3. Higher customer satisfaction. You have happier customers because they can find out everything they need to know without delay. 4. Reduced error rates. There is less likelihood of error since information doesn’t have to be repeatedly typed into an order fulfilment system. a. Corrective actions to improve supply chain performance. b. Designing new products and services. 3. Lower storage costs. Less paper correspondence means less storage required by your customer and you. It has to be well designed. Your portal has to have a well thought out purpose in mind. Do we want customers or employees to learn about products and services, place orders, open an account, monitor orders, make payments, give feedback, check on jobs, collaborate on product and service delivery, access project related documentation and correspondence? That purpose has to be clearly articulated and its implementation might have to be staged to reduce the complexity faced by your designers. The layout, the artwork and the sequence and amount of workflow on each page needs to be carefully considered. Security is also a factor to keep in mind, as much of the information relating to your clients purchase history and product and service delivery will be commercially sensitive. Your customers will be used to interacting with you by other means. Changing their behaviour will take effort but that also presents a great opportunity to interact more closely with them. Once they see how easy it is to use and the benefits begin to accrue then watch those customer satisfaction scores go sky high. No matter how well designed your portal might be nor how much training you give customers and staff on how it works, it won’t do any good if you don’t organize your company to support the portal. That means staff need to heed the enquiries and service them promptly. A tracking system needs to be in place that reminds staff members when tickets aren’t being serviced or are taking an inordinate amount of time to close. Customers will go back to phoning you if they can’t get a positive result from the portal. A number of our customers have implemented portals that have significantly reduced their overheads and improved their customer responsiveness. Canterbury Filter Systems (CFS): CFS is a supplier of industrial filter systems; they have differentiated themselves by offering maintenance services to their customers. Their portal gives their clients instant access to their maintenance schedules and how far CFS has progressed in fulfilling those schedules. They can also access their own accounts and keep track of prior payments as well as accounts payable. CFS keeps their entire catalogue online including technical specifications for each item, making it easy for design engineers to select the right filter for their new systems. SB Global Logistics (SB): SB is a supply chain solutions company that provides third party warehousing services to its clients. In this way, their clients don’t have to invest in their own warehousing facilities but share SB’s warehouses with other clients. SB’s portal allows these clients to monitor and control their stock without needing to directly contact SB’s staff. Portals bring a lot of the convenience that modern technology allows to your customers and staff. If a self-service portal looks like it might suit your business and you’d like to find out more, contact us and ask away.